Song A’ Th’ Week: "Wheels Of Fortune". Got a spare moment? Good. Get in your car, then drive over to the nearest Interstate highway. Road trip! When you get there, don't drive onto the Interstate itself. Park on a side road, and watch the traffic on the Interstate. How much time passes before you see an eighteen-wheeler pass by? Not too long. Eventually you'll see a big rig rolling down the road, and the chances are that truck isn't stopping in your state: it's probably on its way to a terminal two or three states away. Long-haul trucking began in the early 1900s, as a means of transporting cargo to locations that could not be reached by railroad. But the long-haul trucker as we know him didn't exist before the mid-1950s; and he exists only because of the Interstate Highway system, officially known as the Dwight D. Eisenhower System of Interstate and Defense Highways since 1990. "Motor wagons", the precursor of the modern truck, were designed for small loads and short distances. During World War I, the road system in the U.S. began to evolve and the sheer amount of cargo destined for the armed forces overwhelmed the capacity of the railroads. Trucks became larger and more varied. But a major limitation to long-haul trucking was the lack of roads which were good enough for heavily-ladened vehicles. In 1919, Army Colonel Dwight Eisenhower travelled from coast-to-coast across across the United States. He was part of a program to encourage the development of a national defense system, and part of that system required the rapid movement of troops and supplies across the country. Eisenhower found that the highways of the United States were in poor repair. In many cases, those roads weren't even paved: they were little more than a layer of gravel, if that. Most of the mileage was unmaintained dirt that become unmaintained mud when rain fell. A nationwide "system" of highways did exist then, the "named" highways of which the Lincoln Highway was the first and probably the most well-known. These routes were usually marked by colored bands that were painted on the telephone poles that followed the road. But the actual routes weren't as useful as they could be, and they often were not even direct routes across the country. Since there was no organization to oversee the markings of these named highways, their roadbeds often made nonsensical turns away from the best route so that the highway would pass through a particular town. Remember the western movie plot of "where will the railroad go?" This is the same idea, except that road signs are a lot easier to move than are railroad tracks. The Federal Government had become involved in the creation of national roads when the Supreme Court determinded that such roads could be constructed for the purpose of regulating interstate commerce. Prior to that decision, highway construction was considered to be the responsibility of state and local governments. The macadam road surface, invented by John MacAdam, became the preferred material for creating better, smoother roads. Between 1914 and 1956, several bills were passed by the U.S. Congress with the intention of improving the roads. The American Association of State Highway Officials, created in 1914, became the states' voice for the process. Some "rural post roads" were improved (the Federal government was obviously responsible for the delivery of the mail), but such improvements had little effect on the overall problem. By the mid-1920s, the confusion which resulted from the non-standardized "named" highways was removed by the Federal Aid Highway Act of 1925, which created the "U.S." numbered highways. The road surfaces continued to improve, as the responsibility for the now-identifiable routes (no more "hijacked roads") was easily established. By 1926, 500,000 miles of paved road existed in the United Status. U.S. 66, which travelled from Chicago, Illinois to Los Angeles, California, became an example of the new type of highway: well-marked, paved, and maintained. Trucks began to change. Prior to 1931, almost all motor vehicles were powered by gasoline-fueled engines. Early vehicles (pre-Henry Ford) also used steam power, but steam fell out of favor due the promotion of gasoline fuel by the original Standard Oil company. (Now you know who to blame for the U.S.'s current reliance on imported oil.) In 1931, Cummins began the development of the diesel engine for trucks. Since then, diesels have become the dominant engine for large cargo-hauling vehicles. By the time of World War II, travelling across the U.S.A. was not an unusual occurence. A truck could drive from New York to San Francisco in about four days. But still, that distance was largely two-lane road across stretches of wide-open country. "High-speed" travel was still in the future. The changing automotive technology after World War II demanded better roads. The cars (and trucks) got faster, but the roads of 1950 America had been build pre-War, and they hadn't been built with the idea of vehicles that could move at 70 miles per hour. Those highways, as good as they were, were made when a car travelling at 40 miles per hour was a brisk pace. Then the big change happened. In 1952, Dwight Eisenhower was elected President of the United States. Since 1919 he had been a proponent of a national highway system. The needs of transportation during both World Wars indicated that to properly defend the U.S.A., the armed forces needed good, reliable roads on which to transport their cargo across many states. The Federal Aid Highway Act of 1944 created a charter for a "National System of Interstate Highways", but the actual funding for such highways did not occur until the passage of the Federal Aid Highway Act of 1956. And with that Act, the construction of the coast-to-coast (and border-to-border) network of Interstate Highways began. Now the long-haul trucker could travel in relative comfort. While cargo transportation by rail did not decline, transportation by truck increased with every year. And with that increase came the inventions of which we're familiar: the truck stop, which catered to the needs of the diesel-driving man; and the Citizens' Band radio, which was originally envisioned as a low-power, short-range method to facilitate communication between businesses. Soon to follow were Dave Dudley, Red Sovine, and other musicial acts who told the tale of the modern knight-of-the-road, pushing his trusty steel-and-rubber steed across the plains. Once it was a challenge to haul cargo across the U.S.; and now it's an occupation. Every day, thousands of trucks criss-cross the country, delivering loads that can't wait for the schedule of a railroad and can't be flown by airplane because of the expense or size or weight of the cargo. Most of these drivers are men; but there are a lot ladies out there, too. To all of you, thanks for doing a good job. Whether you're moving furniture to Kewanee, Illinois or FedEx packages to Dallas, you have an impact on my life. A quiet place. Really quiet. Looked like the end for old Sloan. …said C.W. in the song "Sloan", as he searched for his canine companion. This is Fiscus, Iowa. We would say that these are the highlights, and we would be right. 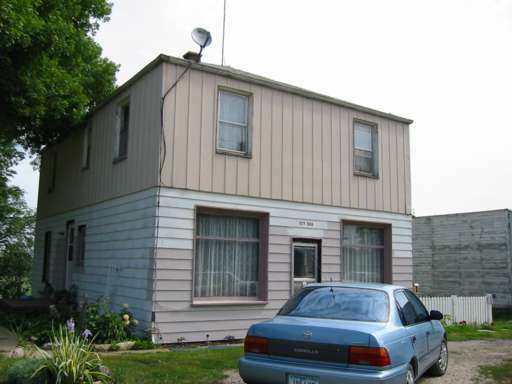 The population of Fiscus is a whopping 10, and there are six buildings in the entire town. The City Hall was being repainted when we visited; the mayor was doing the work. Adjacent to the City Hall is the Fiscus Garage. We're pretty sure that it's fake. Either that, or the barber was napping. 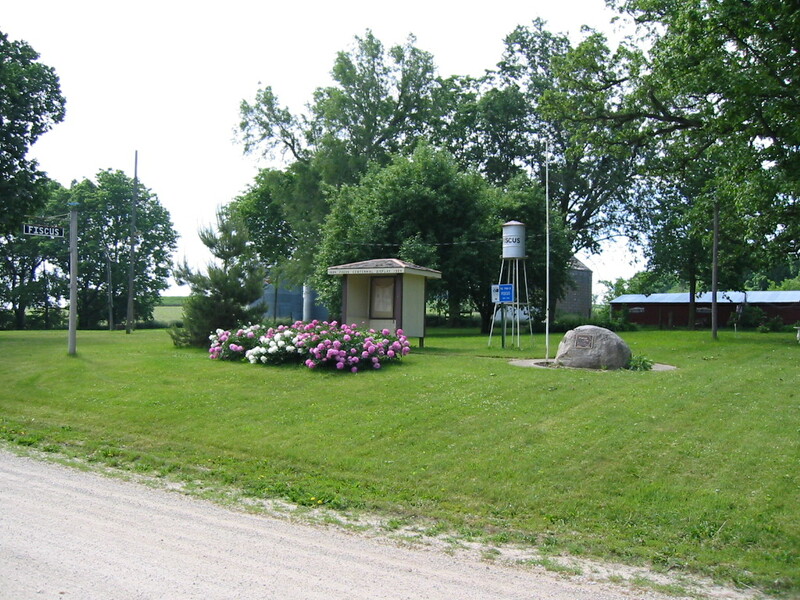 Across the street from the City Hall and Garage (and with only two streets in town, that's not saying much) is the City Park, arguably the most interesting sight in Fiscus. Fiscus was founded in 1884, and it celebrated its centennial in 1984. According to our sources (the mayor, actually), over 1000 people attended the event. The covered display in the center of the picture contains newspaper clippings about the centennial, and items of interest about local people. Mr. and Mrs. Everett Paulsen and Rev. Jensen made a trip to Omaha on Thursday of last week. — excerpt from a news clipping in the park. 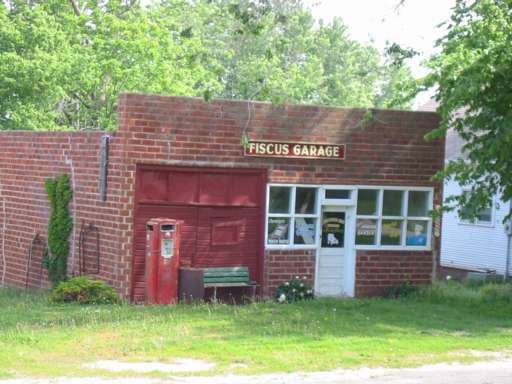 Yeah, Fiscus is a really small town. Of course, no endeavor is without its pitfalls. For the trucker, there's the first choice: be an independent owner-operator, or work for a trucking company. To those (fool-?) hardy souls who have opted for the first choice, this song's for you. May your paycheck arrive before the repo man does. He said, "I got somethin' here, guaranteed ta change yer luck. "I can put you in a brand-new diesel truck." "It's easy; all ya haveta do is drive." I was gonna be the richest man alive! 'Cause when I truck on home, you know just what they do? The Legend-News is published fortnightly — unless the fortnight is the fifth Monday, in which case it's published fortnightly-and-a-half — by TechRen Enterprises, on sale for one day only! Contents Copyright 2002 TechRen Enterprises, except for anything that we borrowed from someone else. Thanks to Bill Fries and Chip Davis for the words and music, and thanks to a Large Multinational Record Company That We Can't Name Because They Might Notice Us for not suing our pants off. "Don't whiz on the electric fence."